The Parish of Saint Philip was founded in May of 1962 when the Most Reverend John J. Russell, Bishop of Richmond, agreed to purchase 12 to 15 acres of land in the Broyhill Park Subdivision and appointed the Reverend L. Longiuire Speight as the first pastor. The Bishop carved the new parish out of three contiguous parishes: Saint James of Falls Church, Saint Michael of Annandale and Saint Anthony of Bailey's Crossroads. Since the major portion of the parish was excised from Saint James parish, the Bishop suggested that it be named Saint Philip, the brother of James the Apostle. The first Mass was celebrated on September 9, 1962 in the auditorium of Whittier School. 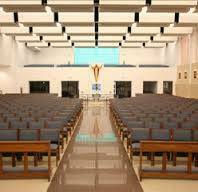 On November 10, 1963 the first Mass was celebrated in the new church and the dedication was held on December 15, 1963. In September 1964, the school was opened under the supervision of the Sisters of Saint Joseph of Chestnut Hill, Pennsylvania. The church buildings and grounds were completed by February 22, 1967. In 1989, our school sadly saw the departure of the Sisters of Saint Joseph after 26 years of dedicated service. That year we also saw a first for our diocese with the reorganization of our school with neighboring Saint Anthony's under its new title “Corpus Christi“. The early childhood center (preschool, kindergarten) is located at Saint Philip campus, and grades 1-8 at Saint Anthony's campus. In August of 1965, the Reverend John T. Cilinski was appointed as the second pastor of Saint Philip. Father Cilinski remained pastor for 16 years, until May of 1981. The Reverend Charles A. Ryan was then appointed as the third pastor in June of 1981. He served the parish until November 1986, when the Reverend Richard B. Martin was appointed that same month as the fourth pastor of Saint Philip. In November 1987, Father Martin proclaimed a year long period of celebration honoring the 25th anniversary of the parish. Saint Philip's present congregation numbers around 3,900, one of the smallest Catholic communities in the area. Being a smaller congregation has lead to a friendlier and more personal community that often-times is lacking in larger parishes. Saint Philip Community, “The Church With A Welcome”, invites you to become an active part of our parish family. We look forward to sharing with you and your sharing your gifts and talents with all of us. Peace to you from the rectory! It gives me great joy to welcome you to the new St. Philip Parish Website! Please see this updated website as a window to the parish, giving you a chance to peer in and find out all that is happening at St. Philip Church. Likewise, this website seeks to follow the example of our patron, St. Philip the Apostle, who brought a future apostle to meet Jesus with the words “Come and see” (Jn 1:47). It is my hope that through our website, St. Philip Parish will help you encounter Jesus, too. To aid you in the process, we have partnered with Our Sunday Visitor, a Roman Catholic publishing company which for over 100 years has been in the media business, promoting the Catholic Faith via newspapers, periodicals, books, pamphlets, catechetical materials, and more recently, social media. In addition to information about St. Philip Parish, the site contains content on Catholic Sacraments, beliefs and initiation. Moreover, the site is up-to-date with ongoing reflections by Pope Francis, prayer meditations on the daily Mass readings, and timely articles on all aspects of Catholic life. This is the kind of site you could make as your homepage – a place to keep informed on both parish happenings and those of the Universal Church. Our new website is accessible on computer, phone, or tablet, so no matter what you have, you can go online to get information on St. Philip Parish. I am very grateful to Deacon Cong Nguyen, who for years has kept our website running, and to parishioner Mrs. Vicky Dobbin, who has overseen the design of the updated website, and is our new webmaster. Thanks to Deacon Cong, we have an online presence; thanks to Vicky, this presence has been ushered into the 21st century. Both have worked hard to make the St. Philip Parish Website an instrument for sharing the joy we have with the Lord Jesus in the Catholic Church. May this updated website help you and many others encounter Jesus, who is “the way, the truth and the life” (Jn 14:6). St. Philip the Apostle – pray for us! To know, love, and serve our Lord Jesus Christ, and like St. Philip the Apostle, to share Christ with the people in our lives, our families, and our communities. We envision St. Philip Parish as a family of God's children, set aflame by the joy of the Gospel, a community of disciples inviting the world to "come and see." For more details about Parish activities, please see our weekly Bulletin.